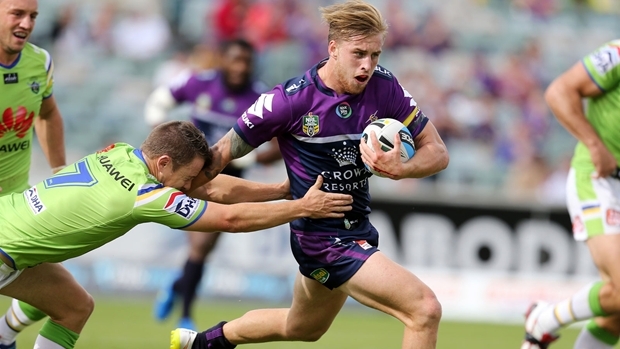 MELBOURNE STORM 14 (Mahe Fonua, Cameron Munster tries; Cameron Smith 3 goals) bt CANBERRA RAIDERS 10 (Jeremy Hawkins try; Jarrod Croker 3 goals) at Canberra Stadium on Sunday. Crowd: 10,536. St George Illawarra Dragons 31 (Josh Dugan, Peter Mata’utia, Tyson Frizell, Joel Thompson, Euan Aitken Tries; Gareth Widdop 4 Goals; Benji Marshall Field Goal) defeated Canterbury-Bankstown Bulldogs 6 (Josh Morris Try; Trent Hodkinson Goal) at ANZ Stadium. Crowd: 20,273.